Have you ever wanted to bike to your neighborhood grocery store, but decided to drive instead because you weren’t up for hauling the kids with you? The Ridekick electric motorized child trailer was designed for precisely this type of dilemma. The mission behind Ridekick International, a company based in Fort Collins, Colorado that was started by Mark Wanger, is to replace short car trips with biking. 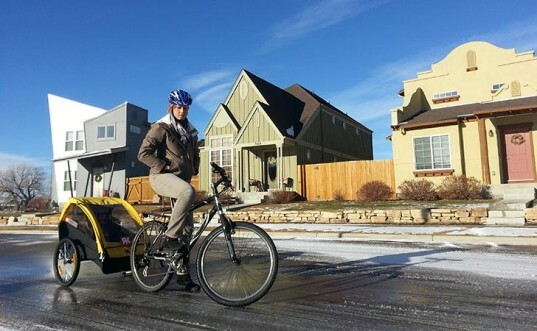 In 2011, the company introduced the Ridekick Power Trailer for cargo, and now they’re introducing the Ridekick child trailer, which responds to the needs of parents who like to bike, but often decide not to because it’s too hard to take their kids with them. Now you’ll have no excuse! Ridekick works by incorporating a brushless DC hub motor and a high density lithium battery to remove the strain from towing kids behind a bike. According to Ridekick, even steep hills don’t pose a problem for their 500-watt electric-powered child trailer. Taking advantage of new controller technologies to increase efficiency, the trailer’s lithium battery can push a bike for 15 miles on a single charge. But don’t worry, the battery, which can be discreetly hidden behind the trailer, doesn’t weigh you down — it utilizes leading edge chemistry to improve power density and reduce weight. And if you’re worried about not being able to control your bike as easily while pulling a child trailer, the Ridekick comes with a linear throttle that straps onto your handlebars and grants you total speed control. The Ridekick child trailer hasn’t hit the market yet, but it is available for pre-order via indiegogo.com. The retail price is expected to be $899 but you can pre-order one now for $699 and expect to receive it by the summer. Have you ever wanted to bike to your neighborhood grocery store, but decided to drive instead because you weren�t up for hauling the kids with you? The Ridekick electric motorized child trailer was designed for precisely this type of dilemma. The mission behind Ridekick International, a company based in Fort Collins, Colorado that was started by Mark Wanger, is to replace short car trips with biking. In 2011, the company introduced the Ridekick Power Trailer for cargo, and now they�re introducing the Ridekick child trailer, which responds to the needs of parents who like to bike, but often decide not to because it�s too hard to take their kids with them. Now you'll have no excuse!